eNLokam: Nissan Unveiled Driver less Car! 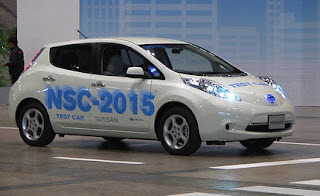 The Japanese car maker, Nissan, has unveiled an all electric concept car recently which is bale to drive and park by itself. 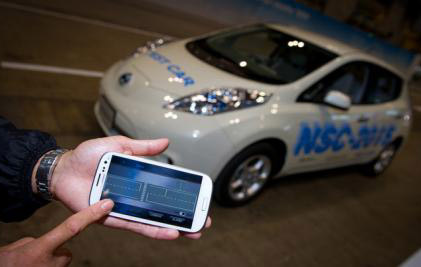 The advanced functions on the car are controlled from a smartphone. When the driver gets to his destination, rather than look for a parking spot the driver can tap a “park in” button on his smartphone car app and leave the rest up to the car. In automatic driving mode, the first thing the car needs is an accurate map of its surroundings. That’s fed over an LTE data link that the car relies upon for all its communications. Then the car pulls in images from four high-definition cameras placed around its body and attempts to recognize its location. This is a more accurate method than using GPS. It may be commercially available in 2015. Google is perhaps best known for the technology. It has started testing a self-driving car system since last year.